Salsipuedes is the name given to a 5,000′ deep channel in the northern Sea of Cortez that runs north and south between the Baja Peninsula and a string of rocky barren islands about 10 miles off the coast. When tidal changes and currents combine with strong and unpredictable wind patterns, the resulting large square seas can make for a very unpleasant trip; hence the name, Canal de Salsipuedes, or Leave if You Can Channel. We’ve been skimming the edges of Salsipuedes for the past week or so, enjoying and sometimes enduring, the changeable conditions in the northern Sea. Up here the feeling is quite different than in the southern or central Sea of Cortez, in that it’s more isolated, more challenging, and more rugged. For whatever reason, few cruisers venture this far north. This is our second trek around the northern Sea and it’s a place that holds its own magic. Our first night we anchored on Isla Salsipuedes, a small rock pile about 12 miles offshore with an indent that passes for an anchorage. We dropped the hook next to a 400′ wall of rock and splashed into shore on our paddle boards to explore the island. Our little bay was covered in 1000’s of grebes that would swim in tightknit packs, suddenly diving and reappearing as if of one mind. It was a riot to watch and listen to, as they all did a lovely synchronized swimming dive together, then they’d pop up a little ways away to start the whole process over. The colors, the bird life, the isolation…all perfect. We timed our departure with the incoming tide so as to catch the tidal current for our trip north across the channel back to the coast and to a favorite anchorage called Animas Slot. The channel is formed by huge underwater canyons that drop steeply from sea level to over 5,000′, and when we passed over the underwater cliffs it was wild to see the glassy sheen on the water bordered by tide rips that are created by the huge up welling rising from the depths. Think of a fire hose being aimed at a brick wall, with water shooting up the wall to the 5th or 6th floor. Our speed over ground would slow by as much as 3 knots when we went through the back eddies from one of the upsurges, and when the current was behind us we were making 8 knots. I wouldn’t want to venture through the channel against the current or with an opposing wind. The narrow slot south of Punta de Las Animas (Point of Souls) is a one-boat cove that we had visited on our first trip into the northern Sea two years ago and we knew we wanted to spend time there again. Two rocky points that jut into the Sea protect it from the running swell, and once inside there are a couple of hidden reefs that limit your swing radius. 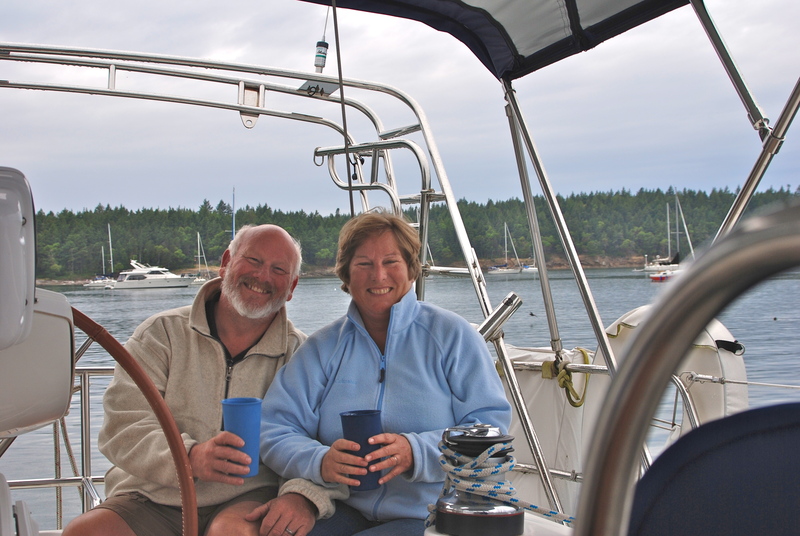 We dropped the hook on our previous mark, paid out enough rode to avoid the rocks but make us feel comfortable for a few days, and popped an anchor beer. The wind was pretty gusty when we arrived so we settled in to watch the boat turn, check the depth a few times as the tide went out, and get a happy feeling that Happy Dance was well and truly set. Then it was time to explore. We hopped into the kayaks and headed for a look-see around the bay. It’s a beautiful white sand beach fringed with lots of colorful craggy rocks. There was an osprey nest on the northern point with an osprey sitting in the nest and another one circling or resting on a nearby cactus keeping watch. They’d take turns fishing and never came back to the next with empty talons. At one point we were just coming out into the cockpit for some sunset watching, and slightly off the point a humpback leaped completely out of the water and performed a 180-degree rotation before splashing back into the Sea. (I gave her a 9.3, but the East German judge only gave her an 8) Then a baby started practicing his leaps, once, twice, take a breath, try it again…nice job! Momma had to show baby how it was done so she started up again. Wow, you have to love the sunset cocktail shows around here! Our next stop was the “booming” village of Bahia de Los Angeles or Bay of Angels. The only booming we noticed was the sound of the loud music coming from the beach where tents were being set up for the upcoming off road race event, but we tend to enjoy the Mexican tunes floating from shore – that is until it’s 2am! We went to shore to visit our favorite restaurant in Bay of LA, called Guillermo’s. Shrimp tacos, shrimp omelets, a couple of cervezas, and then it was time to walk to the Mercado for groceries. Bay of LA is looking pretty sad since our last visit, with buildings much in need of repair after the hurricane and many houses either closed up or abandoned. It’s too bad because it really is a beautiful spot with plenty of islands nearby to explore and a fairly well protected harbor. The problem for us was the threat of the nightly west winds that can blow over from the Pacific and gain strength as they blow down the sides of the mountains. We’ve experienced the “elefantes” before and didn’t need to repeat the occurrence. We’d planned our arrival in B of LA to meet up with our buddies on Cake whom we hadn’t seen since leaving La Cruz. They were helping Sheri’s brother drive a chase vehicle for a race crew in the NORRA 1000 pro-truck rally, and were going to be staying overnight in the village as the rally worked its way south. We were so excited to hear their voices calling us on the VHF, and then to get big hugs after we dinghy-ed to shore. We shared a couple beers and tried to catch up on all the haps in a short time, but unfortunately duty called and Ken and Sheri had to head to the camp site to get dinner going for the racers. We were bummed not to be able to join them, but without wheels it was going to be hard to follow. So we headed north and anchored in one of our favorite spots for the night, a little indent between the impressive tall red cone of the volcano on Isla Smith and the rocky cliffs of Isla Mitlan, about 8 miles NE of Bahia de Los Angeles. The anchorage is open to the NW, but since we were only a little over a mile from the peninsula we didn’t expect a huge amount of fetch with the light 10 knots of westerly that was forecast for a few overnight hours. Wrong! Around midnight the forecast of light west winds became a gusty 20+ knot blow right down into the anchorage creating breaking waves all around us, and put us onto a lee shore. In addition to the wind was a full moon tidal change that held Happy Dance abeam to the wind for a couple hours, captive by her deep keel in the current so that she couldn’t point nose into the lumpy waves. The combination of beam to the waves made us heel clumsily in the gusts creating a very unpleasant ride. I tried to point us into the wind by steering Happy Dance on bare pole wind power, but as soon as the bow was almost pointed into the wind, the incoming tidal current would push us back abeam. When dawn arrived with enough light to see the reef, we weighed anchor and departed and made for the protected anchorage of Puerto Don Juan about 8 miles south. It was a wild ride, with gusts in the 30’s and steep 6-8′ wind waves, so we rolled out our storm jib and headed southeast. As we made the turn around the point into Puerto Don Juan, Happy Dance made one final crazy roll as we slid down a breaker, then suddenly we were inside, the heavy seas were outside, and the flat seas of the safe harbor beckoned. Take a breath, drop the hook, and back to bed! We spent two nights in Puerto Don Juan that couldn’t have been more different. The first night was a blowsy one, with winds in the high 20’s to low 30’s, but since we were protected from the waves and there was no current to deal with, it was much easier to manage. We still didn’t sleep too well with the wind gusts howling through the rigging, making Happy Dance do the twenty knot two step. Our second day and night boasted much better adjectives; calm, flat, quiet, amazing. We spent the day hiking around the bay, exploring the beaches and climbing up to get a view back to Bay of LA. It’s such an amazing place to explore, with coyotes on the beach, Grebes in the bay, and sea gulls dropping clams on the rocks looking for breakfast. As night fell and it was still calm, we both agreed that it was just teasing us, setting us up for another sleepless night. Thankfully we were wrong yet again. It stayed flat calm all night, Happy Dance didn’t move, and neither did we until nearly 9am. We are usually up by 7:30am to hear the weather report on the SSB, so it was a shock to see the clock and realized we’d slept soundly all night. Your description reminds me of what happened to use in San Juanico, we tried to leave twice during a chubasco and well, we just had to grin and bear it, until it was over almost 12 hours later. Horrible to be on a lee shore in those conditions. Always enjoy reading your posts! Tell Marty I took a voluntary layoff from Boeing, looking forward to retirement! Hope to buy a 22′ Catalina and cruise around the Puget Sound. Sue, another stellar post! For some silly reason I always imagine you sailing along on glassy seas with a slight breeze looking to ruffle Marty’s ‘hair’. It’s a bit alarming to think of you tossing and turning and hunkering down to avoid a big blow or challenging tides. so, Keep reminding me of the messy side of sailing and I’ll try remember there is something other than breaching humpbacks and dolphins! But the good times are, oh so good.